The labor market lost momentum last month as job growth fell to a disappointingly slow pace. The unemployment rate also fell, as more people stopped looking for jobs. The economy added 96,000 jobs in August, down from 141,000 jobs in July, the Department of Labor said Friday. The U.S. lost 4.3 million jobs in President Obama's first 13 months in office. Track his progress since then. Meanwhile, the unemployment rate fell to 8.1%, from 8.3% in July. Economists polled by CNNMoney were expecting 120,000 jobs to be added in the month, and the unemployment rate to remain unchanged. The unemployment rate fell largely because 368,000 people stopped looking for work, many of them young people. Just 63.5% of the working-age population was either employed or actively looking for work -- a 30-year low. "These numbers are not very strong," said Joseph LaVorgna, chief U.S. economist at Deutsche Bank. "The job market is improving, but only gradually." At least 150,000 jobs need to be created each month to simply keep pace with the growing population. In addition to the large number of people leaving the workforce, LaVorgna said two other disappointing sings were that the number of hours people worked remained flat and wages were stagnant. 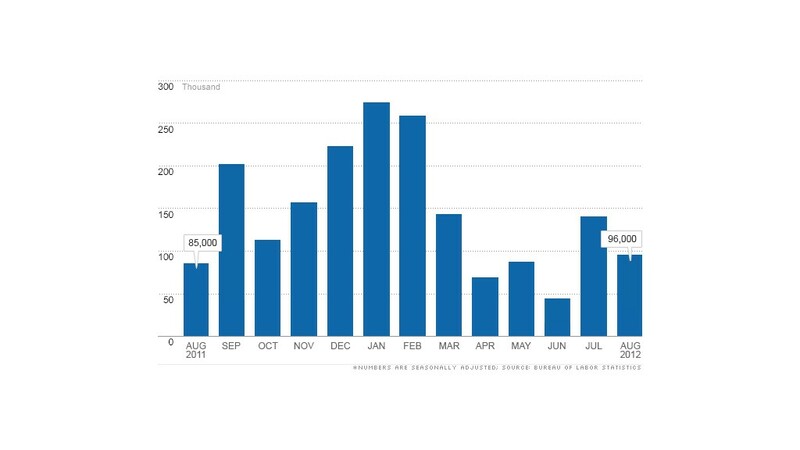 The Labor Department also revised down the job numbers for the two previous months, resulting in 41,000 fewer jobs created than originally reported. "Clearly, it's disappointing, but it's not horrible," said Scott Brown, chief economist at the investment management firm Raymond James. "We're not losing jobs." Employment in restaurants and bars increased by 28,000, a sign that people may have more disposable income. Professional and technical service jobs rose by 27,000, and the health care industry added 17,000 jobs. In August, manufacturing was particularly hard hit, shedding 15,000 jobs. The government continued to shed jobs, losing another 7,000 positions. Just two months before the election, the jobs numbers have become a talking point for both campaigns. But the report was not good news for President Obama, who is still hoping to climb out of the jobs deficit created during his presidency before voters head to the polls. Only two more monthly jobs reports remain before then. "Today we learned that after losing around 800,000 jobs a month when I took office, businesses once again added jobs for the 30th month in a row," Obama said during a speech in New Hampshire after the report was released. "But that is not good enough. We know that is not good enough. We need to create more jobs faster. " The weak numbers could also increase the chances that the Federal Reserve will take more action to boost the struggling economy. The overall job market still has a long way to go recover from the financial crisis. Three years after the recession ended, roughly 12.5 million Americans remain unemployed, and 40% of them have been so for six months or more.